The Army will ask for permission to fly unmanned aircraft in civilian airspace near Army bases for training, according to a recent Army memo. As part of the process, the Army will apply for a certificate of authorization from the Federal Aviation Administration to operate drones near Fort Stewart, Ga., AOL Defense reports. The Army’s memo also outlines processes to determine what areas are authorized, landing and takeoff clearance criteria and air traffic control procedures. According to AOL Defense, the Army believes it needs FAA approval to fly UAS in civilian airspace because the Army frequently sends crews with unmanned aircraft. The FAA frequently requires a chase plane and observers on the ground to watch for other aircraft when a UAS enters civilian airspace. 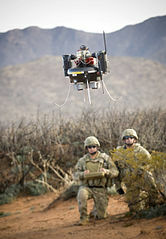 During an exercise at El Mirage, Calif., the Army was required to fly UAS at an altitude less than 10,000 feet and land when civilian aircraft were close buy, according to AOL Defense.